Herb (Herbert) August Gregor went to be with his Lord on October 9, 2018, surrounded by family and friends. Survived by his sons Daryle Gregor (Holly Hardman) and Dale (Lynette) Gregor; daughter Carol (Randy) Hamel; grandchildren and great grandchildren: Christopher Gregor, Brian (Meg) Gregor (Thomas and Esme), Lori-Lynn Gregor (Hope), Michael (Jenn) Gregor (Hunter and Jasmine), Susan MacGregor (Nikolas, Dylan, and Cole), Lindsey (Andrew) Lattoni (Luca and Kaia), and Kurtis Gregor; brother Walter; sister Dorothy; and sisters-in-law Jeannie Gregor and Donalda Gregor. Sadly, Herb is predeceased by his wife of 70 years, Vernice, son Dwayne, one great-grandson, sister Irene and brothers Leslie, Ernie, Carl, Jim and Bob. Herb was born in Davidson, Saskatchewan on August 24, 1924, the third son of Edward and Lydia Gregor. He attended the Meryton school, just east of Davidson, then went on to attend one semester at Briercrest Bible Institute in the spring of 1943 where he wasted no time courting his sweetheart, Vernice. When Herb was called to military service, his father asked for an exemption to work on the farm as his two older brothers Carl and Ernest were already overseas. Herb always said he had to grow up fast to be able to run a threshing crew. Married at Hilltop Baptist Church on May 4, 1945, Herb and Vernice embarked on a journey that would take them from Newdale, MB, to Strathclair, Swan River, Brandon, Winnipeg, Calgary, Davidson, Calgary, Australia, Davidson, Calgary, and back to Davidson, then to Kelowna, BC before finally settling in Vernon, BC. Over the years Herb had many occupations. While he was still farming, he got his carpenter papers before becoming the owner of Herb’s Esso Service Station. He learnt the automotive industry from the ground up and went on to work for Bear Equipment and Marquette Manufacturing, selling equipment and training staff. His work experience didn’t stop there: he started laying carpet and ran his own carpet cleaning business, all the time farming and doing carpentry. Herb loved the Lord and his family. He carried the same picture of his sweetheart in his wallet for 75 years. Vernice went to be with the Lord in 2015, after 70 years of marriage. If you knew Herb, you knew his “stories.” He would tell them to anyone who would listen—often repeated but always interesting. Through his stories he shared his faith, love, adventures, knowledge and history. Always up for a game of crokinole, he would spot you points just so he wouldn’t beat you too bad. He loved to talk horses, and he was especially proud of the Palomino stallion he once owned. He rode and drove horses until he was 93. Herb loved throwing horseshoes and had the trophies to prove he was pretty good, too. Herb had a long life and he managed to make the most out of each and every day. He will be lovingly remembered by family and friends who will cherish the many stories he told. A Funeral Service will be held on Tuesday October 23, 2018 at 10:00 am at Springfield Funeral Home, 2020 Springfield Rd, Kelowna, BC. THIS SERVICE WILL BE LIVE STREAMED/BROADCAST on Tuesday, October 23, 2018 at 10:00 am. The service for GREGOR, Herb is scheduled for Tuesday, October 23, 2018 at 10:00 am. Below you will find the map for the service location and the contact information should you have any questions. He was like a father to me. A great guy, great stories. He always had time to talk and to listen. He will be missed. Wish we could have spent more time together. Carol and family , So sorry to hear of the loss of your Dad. It sounds like you will have many great memories of him . Carol and family, I am sorry to hear of the loss of your Dad. It sounds like you will have many happy memories of him. Harry and I send our sincere condolences Dale and Lynette and extended family upon the loss of your father. Judy. 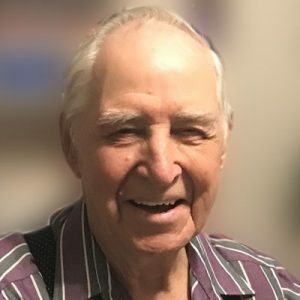 Herb was a long standing member and supporter of the Vernon Horseshoe Club… He was a soft spoken and gentle man who was friended by all who met him. He had a real passion for Horseshoes and was always up for a game. He always had a handshake for you and you had to be ready as had a grip that could put you to your knees.. His memory will always be with the members who knew him. Our condolences to the family. Dear Dale, Lynette and family Dan and I are sorry to hear of the loss of your father. We all have wonderful memories of Herb. Dale, Lynette and family. We are sorry for your loss. Herb sounds like he was such a gentleman. Wish we could have known him. Our condolences to the family of Herb Gregor, especially Chris whom we know and also to his Aunt Carol whom we have met several times. We always enjoyed our visits with Herb and Vernice! Herb especially was quite a story teller and we enjoyed all the history he shared. We trust all of the family will know God’s special comfort during this time of loss and change for you. Carol and Randy, our sincere condolences on the passing of your father. He will be missed by all who knew him.